I’ll be honest, there isn’t much to say about The Double. The film has a slightly interesting premise: Richard Gere plays a retired CIA agent who’s called back into action because “Cassius,” a Soviet assassin whom Gere pursued for decades, has begun killing again. 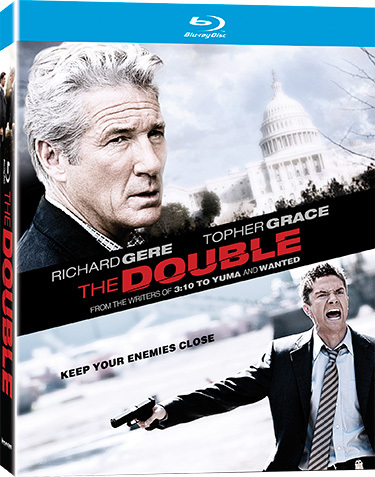 Gere is paired with Topher Grace, a bright young FBI agent who became an expert on the Cassius case while in training. But Gere knows one thing Grace doesn’t: Gere never intended to catch Cassius. In fact, he’s a lot closer to his “nemesis” than he’s ever let on. The trailer ruins the film’s major twist, and first time director Michael Brandt is smart to let the audience in on this left turn about twenty minutes into the picture. Unfortunately there isn’t much else notable here. Brandt and screenwriting partner Derek Haas throw another curve ball at the audience during the film’s climax, but by then its too little too late. The Double feels like a pilot for a new CBS procedural like CSI or NCIS at first, mainly because the whodunnit nature feels so at home on TV now as opposed to the big screen. If they had taken away the final twist and made some slight alterations to the script, this could be the kick off to an interesting series. Instead it’s just a quick one-and-done that fades from memory very quickly. Topher Grace and Richard Gere fare reasonably well. They don’t embarrass themselves at least, but neither seems to be really trying hard either. Martin Sheen shows up to spout off exposition when the script calls for it, and Odette Yustman barely registers as Grace’s two-dimensional wife. The Double has a concept that is very execution dependent, and sadly Brandt and Co fumble the ball a lot. The film feels miscast, unevenly directed, and awkwardly paced. The runtime is listed as little over an hour, but it feels longer. Most of the viewing time is spent waiting for characters to catch up to what we already know, and then quickly trying to recover from fonts of information thrown at us when we least expect it. But don’t get me wrong, The Double isn’t actively bad, nor is it actively good. It just kinda does its thing, and when its over no one involved is embarrassed, nor is the viewer for trying it out. The Double hits a solid single, and while that isn’t respectable, it isn’t anything to frown at either. The Double arrives on BluRay and DVD on January 31st. You can order a copy right here. Comments for BluRay Review: “The Double” are now closed.